Kathi has been affiliated with Siebert Realty since 1981when she was hired to work in the Rental Department as a licensed Rental Agent. In 1999 she moved into the Sales Department as a full time agent and has received the prestigious Circle of Excellence award for 14 years since. In 2004 and 2005 she was a Platinum Award recipient, Hampton Roads Realtors Association’s highest level of recognition and she achieved the Gold award for 2018. Kathi has served as an officer on the Sandbridge Beach Civic League and the Sandbridge Tennis Association and is a member of the Hampton Roads, Virginia and National Association of Realtors. Kathi was born and raised in Springfield, Pennsylvania, a Philadelphia suburb. She graduated from Brandywine College in Wilmington, Delaware and was a Flight Attendant for three years following graduation and traveled the world. Kathi and her husband, Brian, a well-known (retired) builder in the community, lived in Sandbridge starting in 1973, moving here following their wedding. Since childhood, their families summered on Long Beach Island, New Jersey and Sandbridge reminded them so much of the Island and those wonderful days spent “down the shore”. 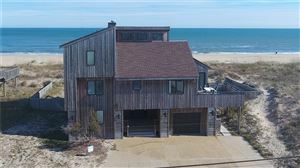 Residing on the bayside of Sandbridge, they raised their two daughters, Kristina, now living on Hatteras Island, NC where she and her husband, Briggs, own and operate Lisa’s Pizzeria and Meghan, a Virginia Beach resident with her husband Richard, a local attorney. Kathi and Brian recently moved to a home on Rudee Inlet in Virginia Beach and their deep sea fishing boat can now be docked just outside the back door. Very convenient!! When they do get some free time they love to go to their farm “Nearwater” on the Eastern Shore of Virginia and enjoy nature with their Labradoodle Roger. Most mornings you can find Kathi on a tennis court getting a match in before work at Cape Henry Racquet Club. Kathi loves attending the US Open and watching her idol Roger Federer up close (yep, the dog is named after him) and she cheered Federer on at Indian Wells in California. Her five beautiful grandchildren are the light of her life and manage to amaze her every day. Over the years Kathi and her husband have purchased investment property in Sandbridge, North Carolina and elsewhere in Virginia, and this enables her to help prospective purchasers understand the weekly rental market and offer insight on how to maximize their investment. And, as a forty plus year resident of this beautiful area, she can attest to a quality of life that is hard to beat.